What is Tater Tot Hotdish? Tater tot hotdish or any “hotdish” recipe for that matter is a simple casserole with a few main components. Typically in these casserole recipes, you will find meat, potatoes or some other kind of starch, along with a combination of vegetables, cheese, and canned soup. Hotdishes have been popular for years because they are convenient to make using only one pan. They are also a favorite because they are very budget friendly. You can feed a crowd with a 9×13 inch pan of tater tot hotdish, or, you can easily get two meals from one casserole. As far as vegetables go, I have found that canned or frozen both work perfectly in this casserole. I typically always use canned green beans and canned corn, because those are my family’s favorites. You can feel free to use broccoli, peas, carrots, or whatever vegetables you prefer! Same goes for the cheese for this recipe. I typically like to use sharp cheddar but have added parmesan as well and it adds great flavor. You can experiment with a mixture of cheeses to make this casserole your own. 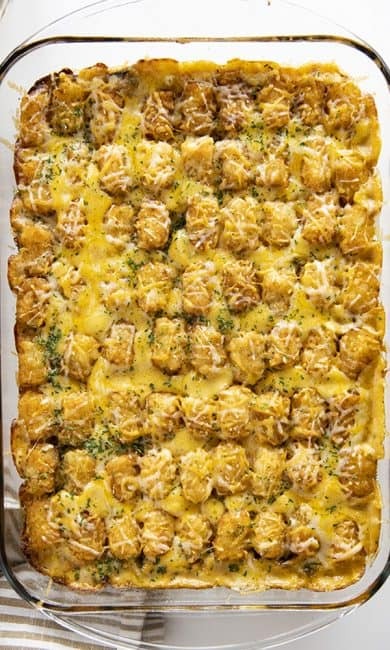 This tater tot hotdish recipe is incredibly easy to make. A lot of times you will see hotdish made by the layering of ingredients with the meat first, then the soup, then the tater tots. My version varies a bit from the traditional layering. 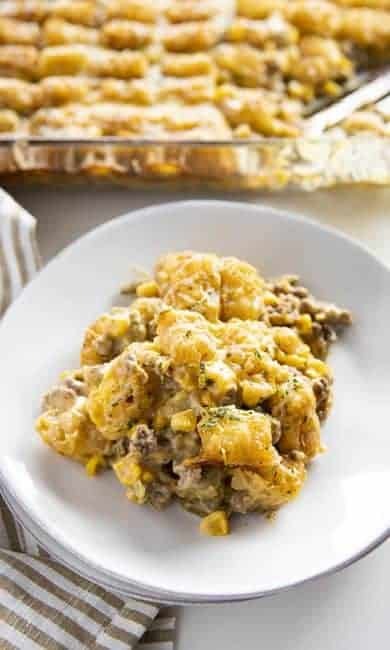 But, I have found after making this casserole for years, that my way makes for the most flavorful casserole with the most accurate cooking time! I start by cooking my ground beef with seasonings, then draining the grease if necessary. Next, instead of layering, I mix the cooked beef together with two cans of soup, sour cream, the vegetables, and cheese. Then, spread the beef mixture in the pan, and top with an even layer of tater tots. By mixing everything together, the meat has excellent flavor, and you don’t have to worry about it drying out! Tater tot hotdish should be cooked at 350°F. As tempting as it might be to cook this casserole at a higher temperature, it is best to go a little lower and slower. Baking at 350°F ensures that the tater tot casserole will be hot and bubbly, the cheese melted, and the tater tots perfectly light brown and crispy! This will take about 50 minutes, then, you can simply add more shredded cheese to the casserole, pop it back into the oven for 5-10 minutes, and serve! 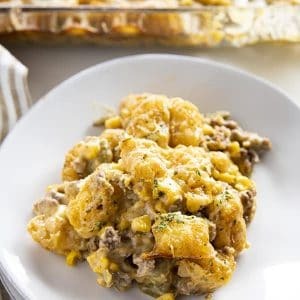 Tater Tot Hotdish is a quick and easy comfort food staple recipe all over the Midwest! 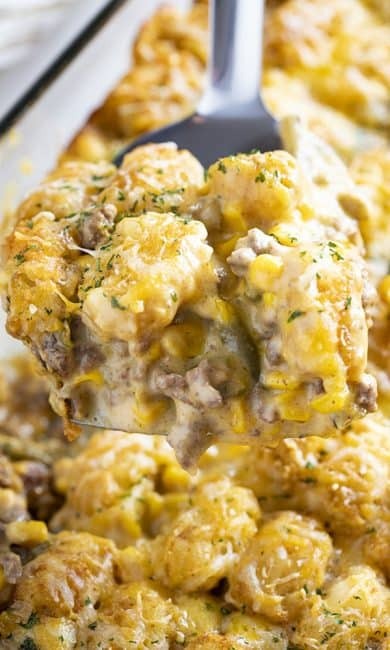 This hotdish is full of meat, veggies, soup, cheese, and topped with tater tots for a super satisfying meal! Preheat oven to 350°F. Grease a 9x13 inch baking dish with non-stick cooking spray and set aside. In a large skillet brown the ground beef along with the onion, garlic powder, salt, pepper, and Worcestershire sauce until the beef is no longer pink. Draine grease if necessary. 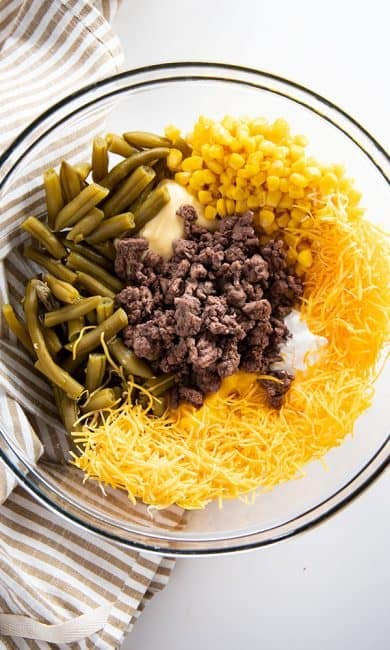 In a large bowl mix together the beef mixture with the sour cream, both cans of soup, corn, green beans, and 1 cup of the shredded cheese. Spread the beef and soup mixture into the prepared pan. Top with an even layer of tater tots and bake in the preheated oven for 50 minutes, until tater tots are brown and the casserole is bubbling. Top the hotdish with the remaining shredded cheese and bake for 5 minutes longer until cheese is melted. What soup could you use instead of the mushroom? This looks amazing and I’d really love to make it, but I don’t eat meat. Do you have a suggestion as to what I should use in its place? Would this still be good without meat? you could probably just use more veggies instead of the meat… or maybe some beans of some sort? Im thinking maybe white beans of some sort… great northerns, or something like that. Why not try musheooms. They should mimic the texture and add substance. Can I precook it , by that I mean cook the meat and prep it in the dish with the tkts and then freeze it? You can. Place the partially baked casseroles in the refrigerator to cool. When it is no longer hot, place it in the freezer. Once it is frozen solid, you can pop it out of its pan. Wrap in foil, plastic wrap, or use a freezer bag. Can I substitute can corn for frozen and beans too? I am making this for the second time and can’t wait! My boyfriend craves it! How many calories do u think is in this dish??? The tater tot hotdish recipe was delicious! Illustrations are yummy and pull you in! You are my new go to. 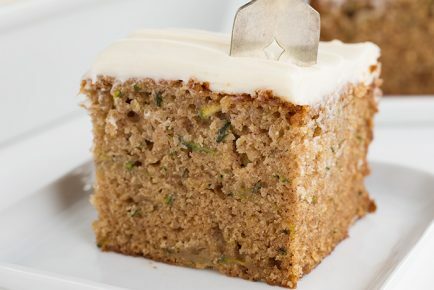 Fabulous website and beautiful, easy to do recipes! Trying your dish tonight minus the corn. 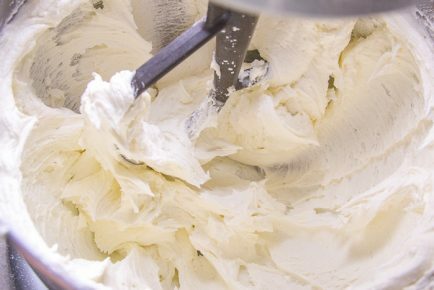 I never use sour cream. I also put a layer of tots at the bottom.I use a little of the corn juice. Lots of flavor there.Don’t use cheese soup. Made this in my cafe weekly.hope this helps. Can I get this tater tot receipt emailed to me???? Tasty just the way it is. Thanks! My grandma made this all the time when we went up north to go fishing. Over time I changed the recipe, last night my daughter and wife said “Hay This Is Good” my grandson said “It looks like pot pie, I like it papa”. We made this with peas instead of green beans, and used a jiffy cornbread mix on top because we were out of tots. It was delicious!!! Did you just pour the dry mix on top? Interested in trying this!!! I made this tater tot hotdish and fell in love with it. Now i make it evrytime i get the chance to…. I use cream of celery and cream of onion soup with 2 cups of 1/2 and 1/2. Sometimes I add shredded potatoes to give it a more substantual texture. When I don’t use meat, I open a can of retried beans, fry them up with some onions and mushrooms. Wow I would have never thought of that, but it sounds good!! How long do you fry the beans for?